With perfectly coiffed Brian Setzer hair, a love for music (love those Stray Cats), his Love for His Rockin' Rubs & Sauces and a passion for BBQ, possibly greater than Elvis's own passion for cars and girls, many would say.... becoming "The King" was his destiny. "The King" was born one night in a room full of family & friends over birthday cake and beer. What began as an evening dressed in an Elvis suit alongside his brother and uncle, in celebration of his mother's 60th birthday, ended with realization that his business Arizona Grill and Hearth, could benefit from "the power of the suit". As guest raved about his newly found persona, at that moment it became clear, with over 20 years of experience in the world of BBQs and an expansive knowledge greater than anyone in his hometown of Tucson, Arizona - With Great Power, Comes Great Responsibility! Val Romero, "THE KING" OF BBQS is known nationally as an expert in his field. His passion to educate those around him, that absolutely EVERYTHING can be prepared on a grill, allows him the opportunity to enjoy the final product among friends. He is known for hosting BBQ events in his venue known as "Grazeland" where guests can bring their own food and experiment with any of The King's Rubs or Sauces, while test driving any one of over 20 units. 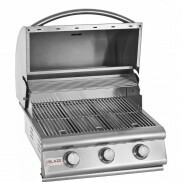 Guest can choose from grills, smokers, cook tops or even a pizza oven as they connect to their inner "King of the Grill". In addition to hometown events, THE KING OF BBQS can also be seen at hot sauce and BBQ expose across the nation in places like Los Angeles, Albuquerque, Houston, Dallas, Chicago, Atlanta, Las Vegas, Nash Vegas, Gulf Shores, and New York. Also keep an eye out for him at RV rallies and tailgating events. It is with this passion and love for BBQ that THE KING OF BBQS brings to you, in addition to his Rock'n Rubs & Sauces, an elite line of smoker and BBQ products. He has used many products over the years and from personal experience can tell you - Not all Grill's are created Equal, we have Grills for your Beginning Backyard Enthusiast, while others are - Fit For A King. Remember to Enjoy Life One Bite At A Time! !